RSVP below. It’s FREE and with no obligations! Briefing fees are due upon confirmation of the brief. Those who have RSVP-ed will be notified when this course has been confirmed. Upon confirmation you will be provided with a link to make an online payment. 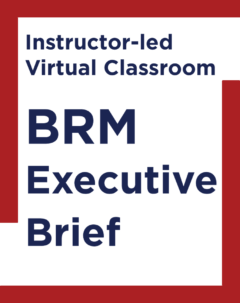 The fees per student are: $375 and include a 3-Month BRM Institute Membership. Fees also include shipment costs of course materials within the Continental US. A surcharge will apply when shipping internationally.